Stampato in Venezia da Giambattista Albrizzi nel 1754. Thomas Salmon (1679-1767) was a Scottish historical and geographical writer who wrote a very popular book, Modern History or the Present State of all Nations (1739). Salmons' work spawned a number of imitations across Europe soon after publication, having been produced at least in German and Dutch. 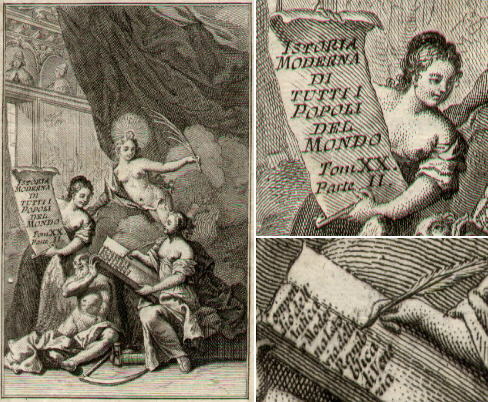 It was published in Italian in Venice from 1740-1762. It was expanded to provide a more ample coverage of the Italian States. A volume was entirely devoted to the history of Venice. It clearly reveals a partisan view of many events; it gives however a very detailed insight into the circumstances of the expansion and decline of Venice in the Levant, the eastern part of the Mediterranean Sea. It contains many references to the Venetian Fortresses in Greece and in Cyprus. The volume is split into six parts called libro (book) arranged in a chronological order. The links below lead to an abstract of the events related to the Levant and narrated in the books. The first book does not have references to the Levant. The Italian text is accompanied by an English summary (by myself). The original text has many words written in italics; usually names of people and of locations but there is not full consistency of approach: Constantinople is usually not written in italics. Some words have a different meaning in today's Italian and some locations are now known under a different name: for this reason both the Italian text and the English summary show many links to the Index of the names page, which provides some guidance also for many of the sultans, kings and popes quoted in the text. Names of locations are often spelt in a slightly different way even in the same paragraph. The abstract leaves out the events which occurred outside the broad definition of Levant, although in some cases episodes which occurred in Dalmatia and Albania are reported. The cruelty of some episodes and the use of derogative words, just show how much progress has been made in improving the relations among the Turks, the Greeks and the Italians.